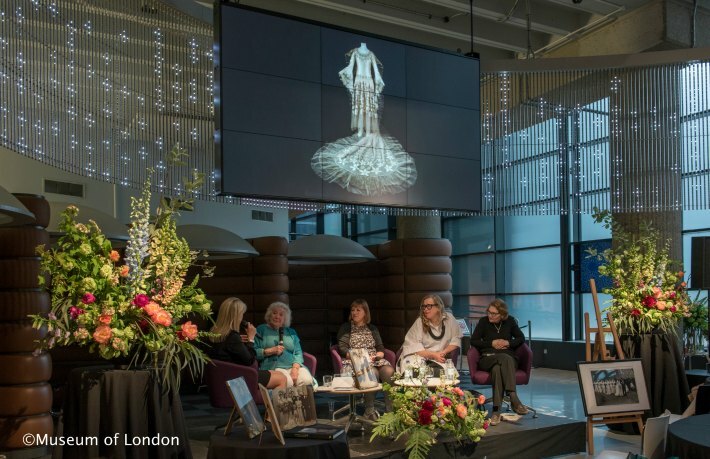 Since you love London so, so much, and you know your thing about weddings, we wondered whether you would like to be involved in talk we are hosting with our Curator Beatrice Behlen, V&A curator Edwina Ehrman, bridal designer Kate Halfpenny and author Kate Thompson…. 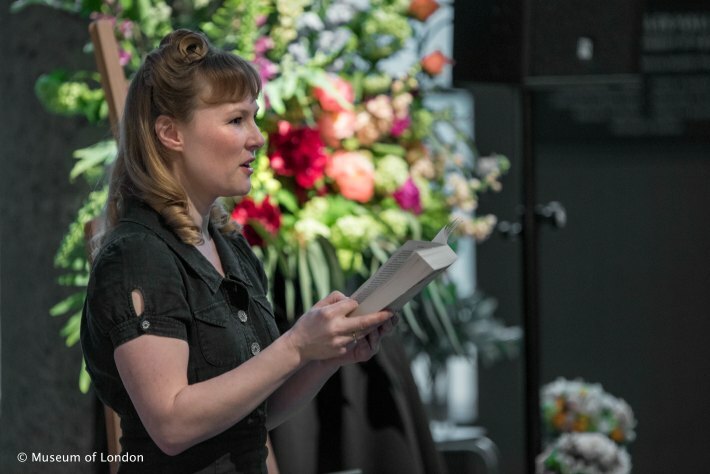 and could you present floral designs inspired by weddings from the 1930s and 40s? Erm…give us a millisecond to think about that…YES PLEASE! 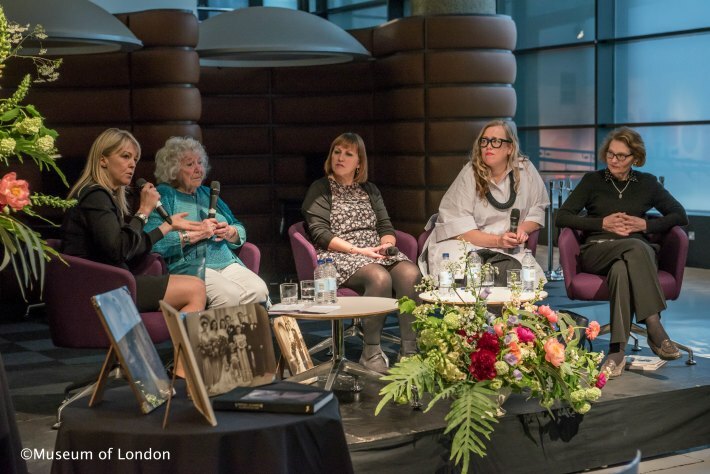 Receiving such a prestigious invitation from the Museum of London is always a cause for celebration but this particular occasion has special meaning for me. 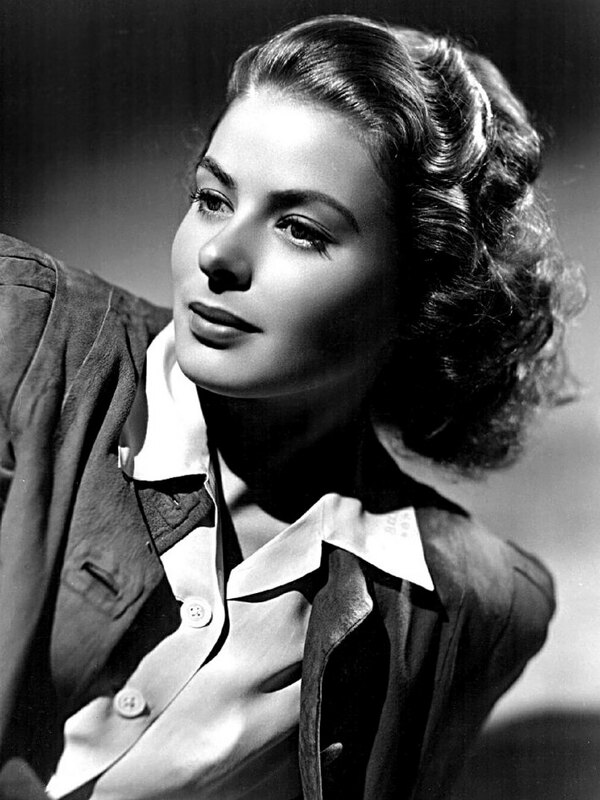 From a young age, I have been besotted with the style influences of the 1930s and 40s; in fact my Mum has often stated that I had watched almost every black and white film from the era by the time I was 12! Combine my ardent 1930s and 40s obsession with Alan’s wealth of social history knowledge and passion for family history research, and this Museum of London invitation served as the perfect opportunity for both of us to showcase our personal passions. 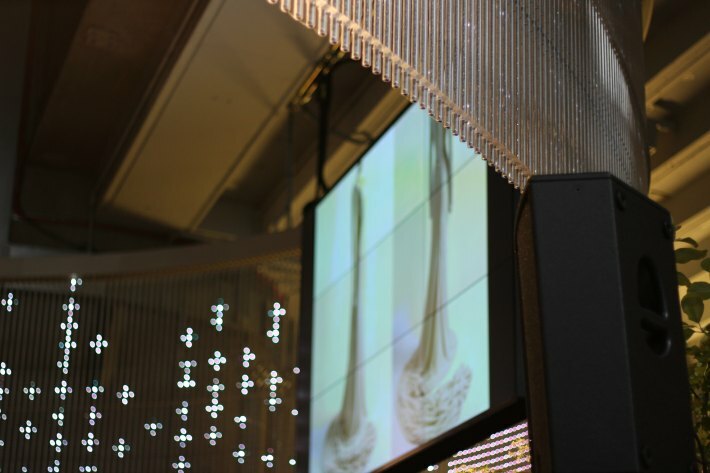 After some careful planning, we decided that our flowers would adorn the stage and that Alan would deliver a presentation regarding iconic wedding floral trends from the era. 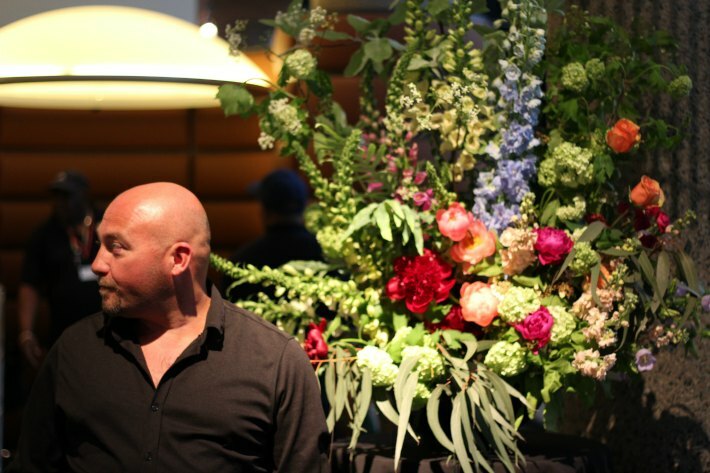 The inspiration for our floral designs would be two women. 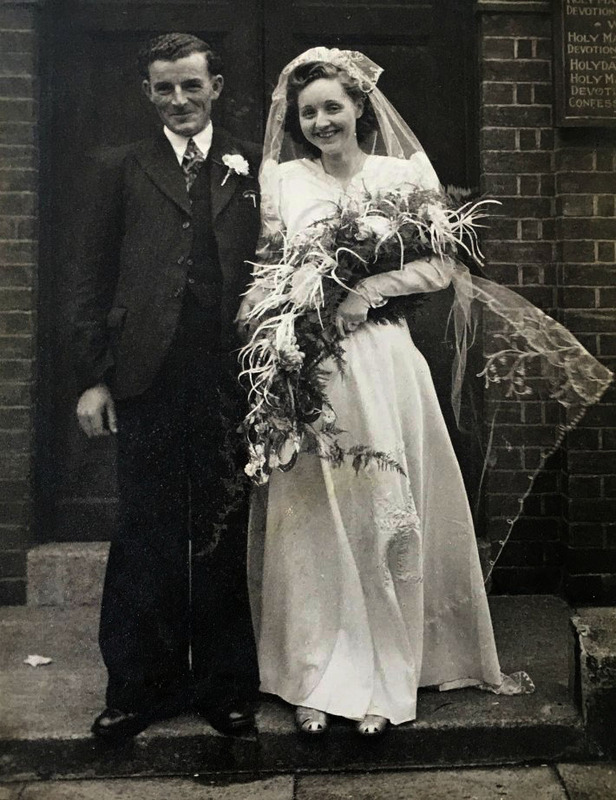 Firstly, we would pay homage to Alan’s grandmother who married in Leicester in 1943 whilst carrying a beautiful bouquet of big, blousy full and rounded grown Chrysanthemums cut from her neighbour’s garden. 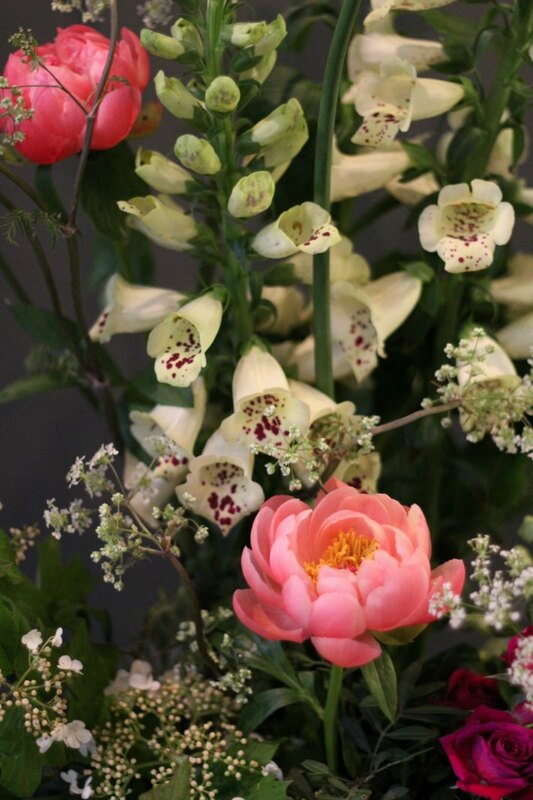 Secondly, we would celebrate the style influences of one of the greatest florists of all time, Constance Spry. 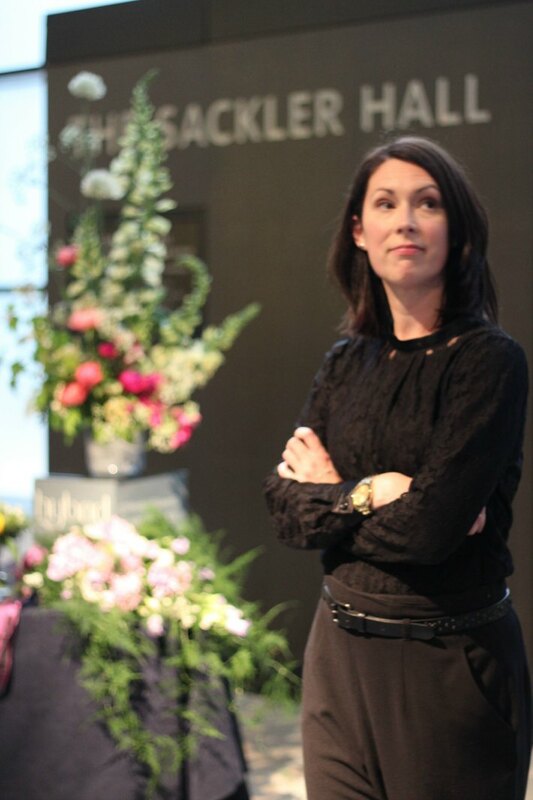 This first lady of florists opened her first shop in 1934 in London’s South Audley Street. 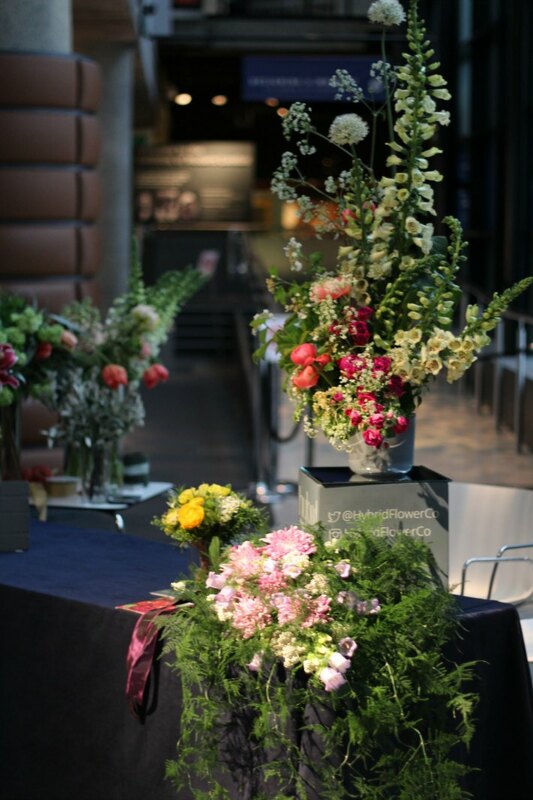 An amazingly talented and determined person, Constance Spry was a pivotal figure within the field of floristry who led the revolution from stiff, formal arrangements to all manner of looser, wilder, more imaginative and exciting styles. 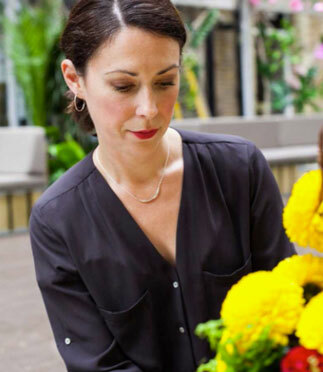 With these inspirations in mind, our aim was to create large and glamorous designs that would highlight the shapes and silhouettes of home grown individual garden style flowers. 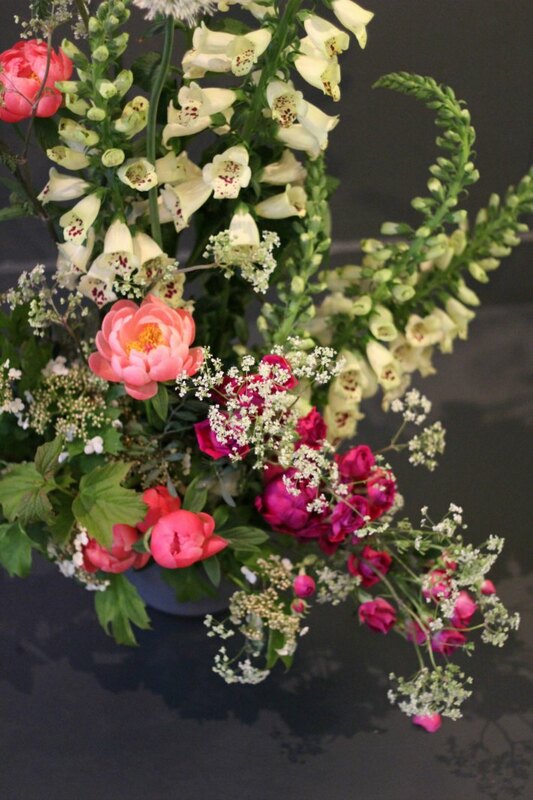 Foxgloves, peonies, delphinium, viburnum, stocks, cowparsley and roses. 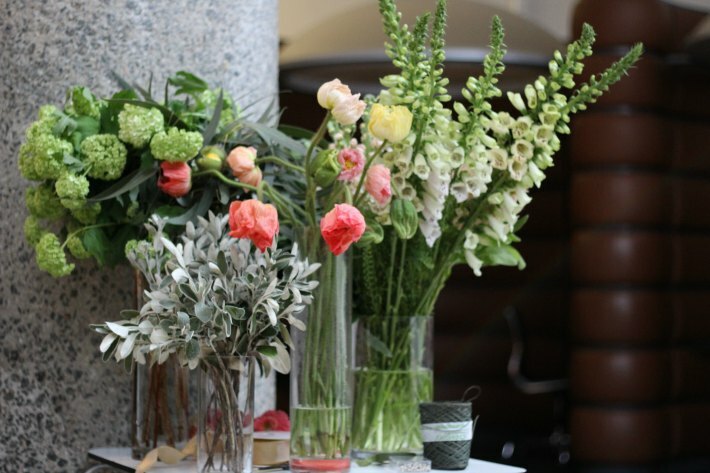 We adored the elaborate yet elegant styles of the 1930s and 40s and really wanted to focus on the idea that friends, relatives and neighbours would come together to contribute flowers, food, skills and time that would make not just a memorable family wedding but a large, glamorous community event. Eastenders – Probably the best storytellers in the country! 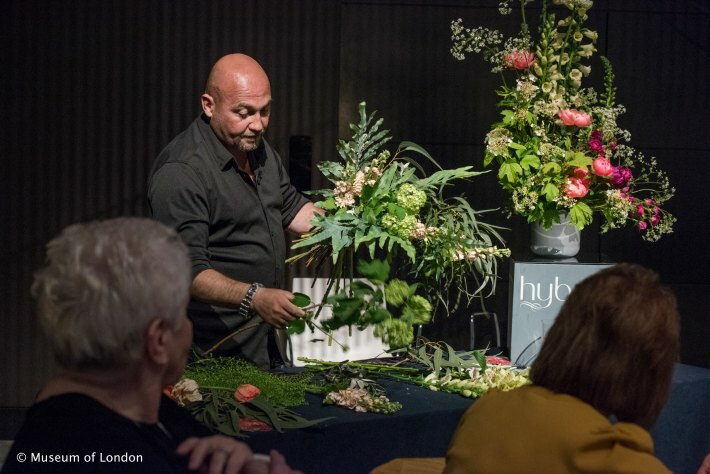 After meticulously planning, preparing and transporting our floral designs to the Museum of London, we entered a fascinating and very nostalgic world. 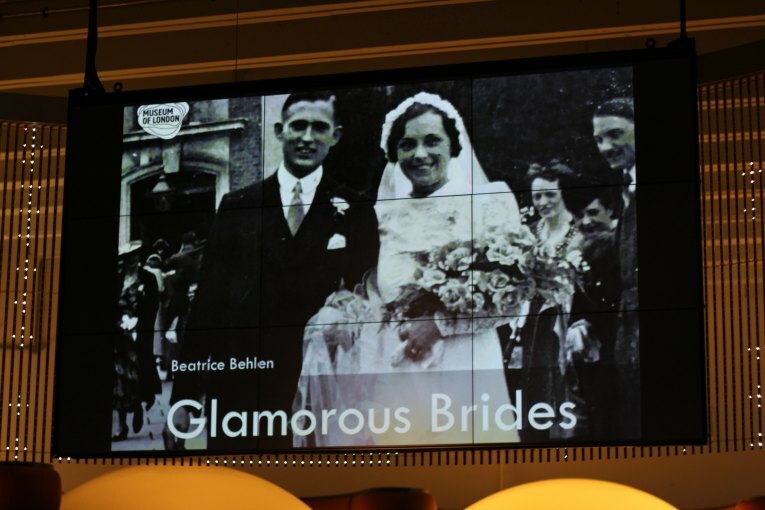 Not only did we hear from experts on East London in the 1930s and 40s, the wedding costumes of the time but we also heard from real-life East End brides and their families who taught us that, even in times of great hardship in the 1930s and 40s, East End weddings were vital, vibrant and very glamorous occasions! These massive celebrations brought entire communities together where everyone could forget their troubles and take part in a happy, broader event; dancing the night away until the beer ran out! Throughout the 1930s and 40s, the East End of London was an area famous for its skilled dress makers, dapper residents and well turned-out partygoers. 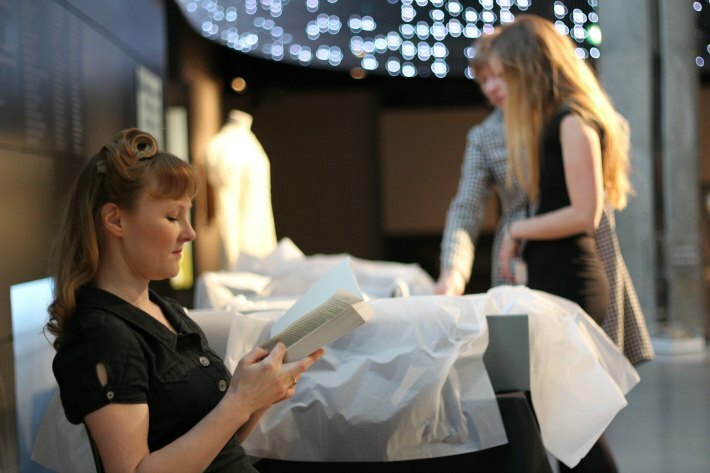 Weekly trips to the cinema were seen as a regular source of glamour and inspiration and many of the dresses worn at these joyous occasions have been donated to the Museum of London and the V&A. 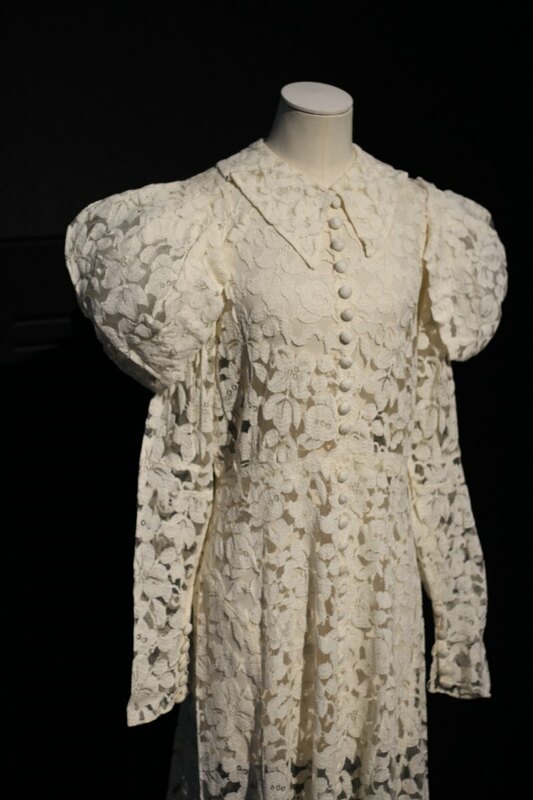 These expertly crafted (and often absolutely tiny) garments represent a defining moment in British social history but they also mean so much more. These beautiful dresses are interwoven with the stories of the people who made them, the fortunate few who wore them and the generations to whom they were handed on. Over the years these garments have adapted and evolved along the way; telling a story of many exciting, engaging and intriguing East End journeys. We were told the most wonderful of stories of weddings from the era and we were able to witness the immense impact that these weddings still had on the whole family today. Weddings are becoming as important as they used to be, it is more about the entire family becoming involved and creativity being prioritised again. A sentiment that we will be sure to share with our future brides!